Stanislaus State has adopted Institutional Learning Goals at both the undergraduate and graduate level reflecting the University Vision and Mission. These Institutional Learning Goals reflect the unique educational outcomes the Stanislaus community believes all Stanislaus graduates will and should possess at the time of graduation. The General Education Learning Goals mirror the Baccalaureate Learning Goals demonstrating the centrality of General Education in the Stanislaus State undergraduate experience. 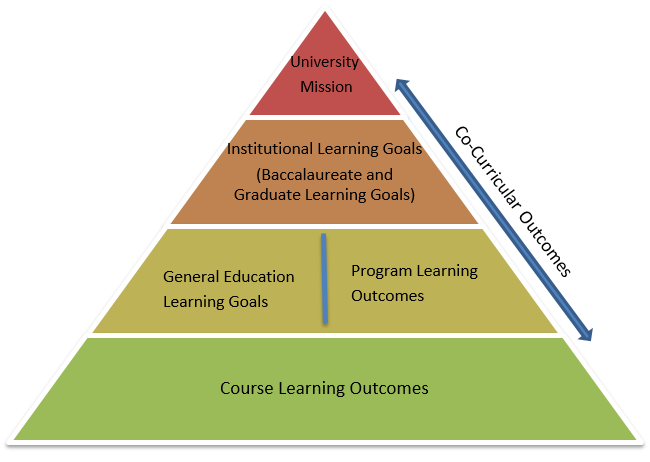 Relationship of Course Learning Outcomes through the University Mission: Adapted from National Institute for Learning Outcomes Assessment. Demonstrate expertise in a scholarly discipline and understand the discipline in relation to other disciplines and the historical context. Develop the intellectual skills and competencies necessary to participate effectively in society and the world. Develop broad knowledge of biological and physical sciences, humanities and creative arts, and social sciences. Develop the abilities to integrate knowledge, make informed ethical decisions, and accept civic responsibility. Demonstrate personal responsibility and civic engagement with respect and appreciation for diverse local and global peoples, cultures, environments, and resources. Develop abilities to integrate knowledge, make informed ethical decisions, and accept civic responsibility. The General Education Learning Goals are listed with outcomes on the General Education website.